The City of Pauls Valley nestles in a fertile vallley carved through millenniums by the Washita River coursing seaward across the plains of south central Oklahoma. Here are some of the richest agricultural and petroleum lands in the state. 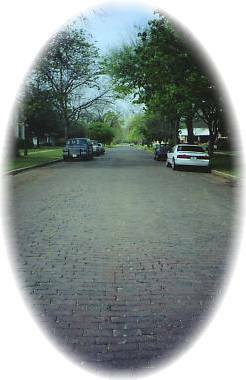 Tall, stately trees arch over more brick streets, (17,986 square yards), than in any town in the United States. Well-preserved historic homes and commercial buildings are treasures that have been passed on from generation to generation. The Pauls Valley Historical Society has informative maps of walking and driving tours of Pauls Valley and Garvin County historic sites that illustrate the area's colorful history. The c.1905 Santa Fe Depot now houses the Pauls Valley Historical Society Museum. Photos and artifacts provide a fascinating glimpse into the development of the area. Main Street Pauls Valley's annual "Valley Brickfest" is held the first Saturday of May, featuring live music, food and activities for all ages throughout the day. Pauls Valley has a Municipal Airport and Interstate Highway 35 furnishes easy access to its many attractions: Wacker Park which has picnic facilities, tennis courts, swimming pool, baseball & football fields, rodeo arena, band shell, rose garden, art center, and Museum of Natural History. Pauls Valley also has a golf course and two municipal lakes with picnic facilities, boat launching ramps fishing and hunting. "The Queen of the Washita" as the City of Pauls Valley was once known was one of the earliest settlements in Indian Territory. Smith Paul, born in 1809 in Newborn. North Carolina, lived with the Chickasaw Indians in Northwestern Mississippi for seventeen years. On a wagon train trip to California, Paul discovered the fertile bottom land which is now Pauls Valley. It is known that Smith Paul was employed by a Scotsman named McClure who was married to a Chickasaw Indian woman. His wife's name was Ela-Teecha, which means Ellen in English. They were parents of two children, Catherine born in 1831 and Tecumseh, born in 1835. McClure died in the Blue River in Pontotoc County and sometime thereafter, probably in 1844 or 1845, Smith Paul married his widow. Sam Paul was born there. Sam Paul was 11 months old when his family came to what is now Garvin County. He died in 1891 at the age of 46. This would indicate that Smith Paul and his family came to this area in 1847 or 1848. Pauls Valley did not spring into being overnight as did many of the towns of Oklahoma. For many years before it formed any resemblance of a town, the location was known as "Smith Paul's Valley." It probably began to acquire the characteristics of a town in 1874. In that year, long wagon trains of Comanche and Kiowa Indians and soldiers established a trail from Boggy Depot to Fort Sill, hauling provisions for the fort and the Indians who had been rounded up and forced upon a reservation nearby. When the Gulf, Colorado and Santa Fe railroad built through the territory in 1887, a dispute arose as to location of the present town. The property bordering the right-of-way at Smith Paul's Valley was controlled by Tecumseh McClure (Smith Paul's stepson). Smith Paul, was a Progressive. The Progressive Party wanted a railroad and welcomed white settlers. When McClure (a Non-Progressive who opposed inter-marriage of whites and Indians and wanted to leave the country as it was) objected to locating the railroad depot on land he controlled. Sam Paul invited them to locate three quarters of a mile north of "his land." When the Santa Fe people placed the sign on the new depot, they shortened it to Pauls Valley. The railroad brought growth and prosperity to Smith Pauls Valley. The first newspaper was published in 1887. The Pauls Valley townsite was laid out in 1892. A U.S. Court house was built in 1895. The first white school in Indian Territory was established and brick buildings were built downtown. In 1909, the streets were bricked. The Masonic Lodge of Pauls Valley is the oldest enterprise in Pauls Valley in continuous existence. Valley Lodge #6 was chartered on September 7th, 1875 by the Grand Lodge of Indian Territory and has met continuously since that time. Silas Rogers was the first Master of Valley Lodge #6. Part of the Historic Downtown tour the Presbyterian Church was built in 1923.